Home Diapering Diapering_: Where do you put it all? Diapering_: Where do you put it all? Thanks to Laura & Cindy for this Frugal Baby Tip! Laura said: I have a diaper stacker that I hang on the end of my changing table, and I put my prefolds and fitted dipes in there, then I have a little organizer thing that goes on the end of the changer for pins, creams, and other little things I need within reach. 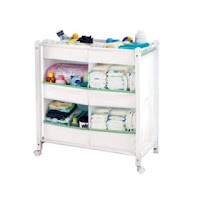 Cindy said: My changing table has two shelves and a drawer. The covers, ointments, etc. go in the drawer. On the top shelf, I have room across the front for onestack each of AIO's, fitted, wipes, liners, and prefolds. Across the back of the top shelf is two more stacks of prefolds and the disposable stuff - disposable wipes, liners, and a few disposable diapers. On the bottom shelf is a container with all the diapers and covers that don't fit at the time, and some blankets and hooded towels. Now that I change Taylor on the floor or bed, the changing area is where the diaper bag stays. The drawer on this table is *so* handy. But I also have a couple of shower gifts that would have come in handy if I didn't have the drawer. 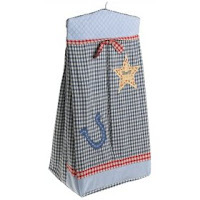 I have a hanging diaper stacker that could hold covers off the side, and a clip on tray that could hold the other little stuff from the drawer.